When I took a spin with the Blue Mo-Fi, I loved the audio quality that these headphones produced. It’s one of the best headphones for digital music available. But I wasn’t the biggest fan of the design. Well, Blue took that feedback and brought to mark the Blue Lola headphones. When you first look at the Blue LOLA headphones they look very similar to the Mo-Fi but they made fundamental changes in the ergonomics of how the headphones fit and rest on your head. They are very comfortable and feel much lighter on my head compared to the Mo-Fi. That lighter feel does come at a sacrifice. There is no powered AMP build into the Lola like it’s older sibling the Mo-Fi. 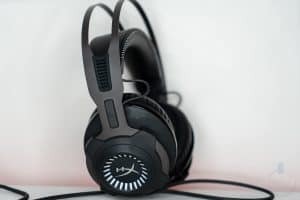 Like the Mo-Fi the Lola are over the ear headphones that are shaped more like an ear that gives a better fit for reliable sound isolation and ambient noise reduction. The earcups contain large 50 mM drivers with a 42 ohms impedance and frequency response of 15hz -20kHz. The packaging includes a soft case, 1.2-meter cable with controls compatible for iOS devices, a longer 3-meter audio cable, and 3.5mm to 1/4″ adapter. You’re getting a full package here for the retail price of $249.99. With all that said the most important thing is “How do they sound?” The sound quality for me is excellent. The lows sound accurate and not over bassy. The mids and treble sound clear and nothing comes through muffled. For my testing, I took the opportunity to use the HTC 10 and it’s high-quality DAC. The music I listened to was a mix of hip hop from the 90s, mid-2000s, and some current hip-hop and also some EDM and trance for testing. The Blue Lola is meant for those that want premium audio quality from digital audio. These are meant for you to sit home and have a listening session. It’s not the most portable, and if you are an on-the-go person, you will want a pair of headphones meant for that. These are for those that want high-quality sound from their local and streaming digital music library. If you’re in that category, I would highly recommend these.